Autonomous sewage for private housing construction is a sign of civilization. But to make the system itself, with its internal and external part - this is not all. All drains need to go somewhere. If the settlement has a central sewage system, then you can connect to it. And if she is missing? In this case, such a design as a septic tank is perfect. Modern models will easily clean all drains without polluting the environment. 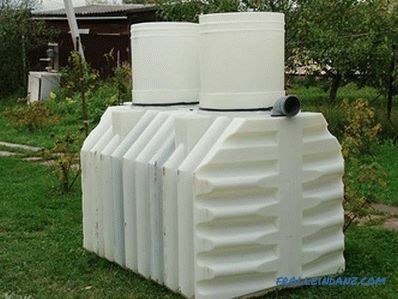 Today you can find many different models of septic tanks on sale. 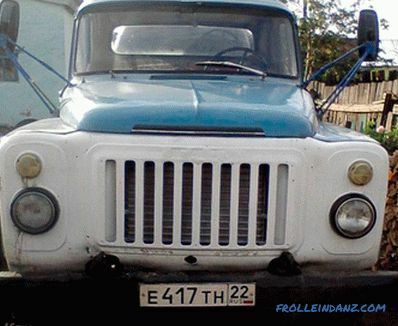 One of the most popular received the name "tank". Such a system has a different power, but all models have a similar design. So, and the installation of them about the same. How do you install a septic tank with your own hands? Let's see. 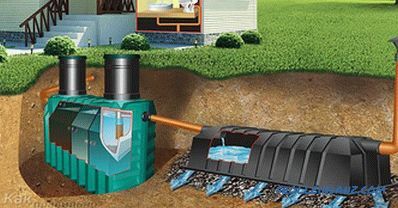 What is a septic tank "Tank"
The septic tank is special device that allows to clean wastewater. Different manufacturers use their designs. All of them have a different level of cleaning, different cost and power. 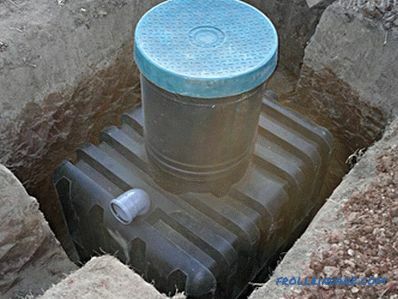 A septic tank can also be made on its own using concrete rings, tires or eurocubes. Having shown ingenuity and ingenuity you can make a septic tank without pumping. Among others, the septic tank is very popular in our country. It is also available in different configurations, but almost all models have a similar design. 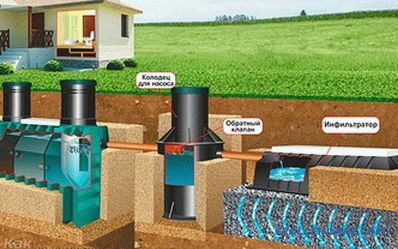 So what is the device of a septic tank? The design consists of several tanks. All of them are connected in series with each other by a pipe system. Capacities of different models have a different volume. The power of the whole device depends on it. 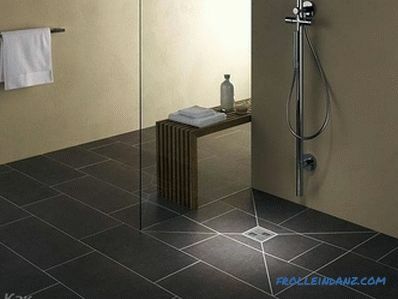 The buyer himself chooses the necessary performance, depending on the amount of wastewater. The working principle of the septic tank is very simple. The drains, getting into the chambers, gradually get rid of pollutants. In the first tank, large particles settle. Such mainly inorganic pollutants do not decompose, so they accumulate at the bottom. Through the pipe located at the top, the drains enter the second chamber, settling takes place here. As a result, water gets rid of smaller particles. Full cleaning takes place in the third chamber. Biofilters are installed here. 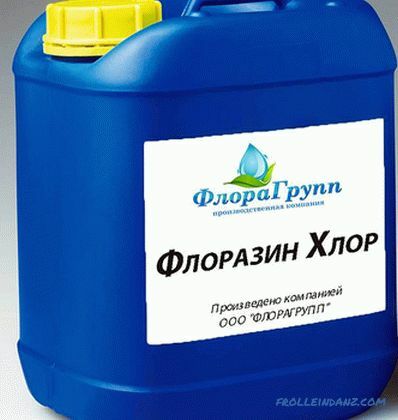 With their help and decomposition of organic pollutants. As a result, drains are almost completely cleaned. Residues from the decomposition process accumulate at the bottom of the chamber. In order for water to be completely purified, it is advisable to use infiltrators. 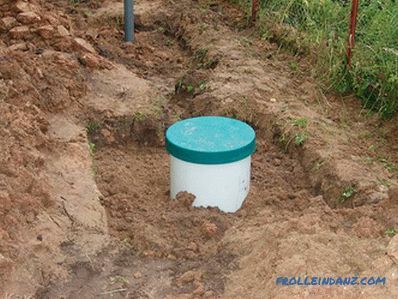 The first thing to do before starting the installation is to inspect the delivered septic tank. Check for any damage. If you miss them, the device may not work effectively. Now it’s worthwhile to start determining the place for installation. Septic tanks will not "smell bad". 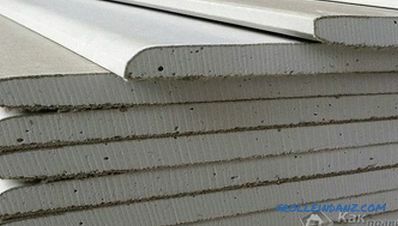 Therefore, there is no need to remove them to the farthest corner of the site, but it is necessary to comply with hygiene requirements. The septic tank must be installed at a small distance from residential buildings and water intake sites. When choosing a place for installation, you need to remember some nuances. First, from time to time it will be necessary to pump accumulated residues, therefore the entrance of the assenizator machine should be ensured. Secondly, installing a septic tank far from home is uneconomical. 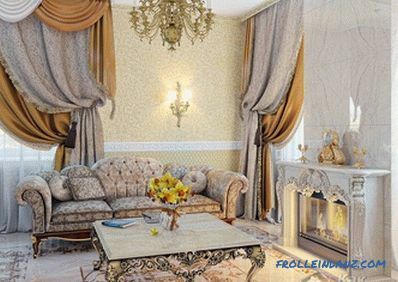 In this case, you have to install a long sewer system. Also pay attention to plantings nearby. The roots of large trees can damage the walls. For this reason, planting vegetation closer than three meters from the installation site is undesirable. If you have decided on a place, you can start work. 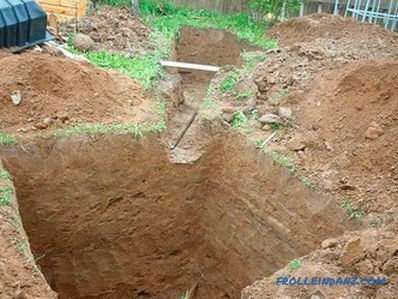 Installation of a septic tank begins with digging the pit. Its size should be somewhat larger than the containers themselves. The sides should be left at 20-30 cm - for backfilling. 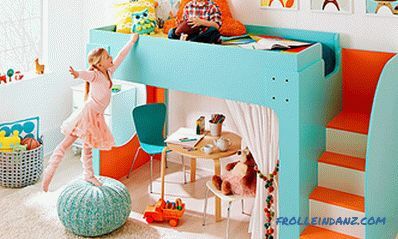 Also, the depth should be increased by the thickness of the pillow (20–30 cm). Sand after backfilling must be carefully tamped. Find out the depth of the groundwater. If it is too close to the surface, then additional work must be done. On a sand pillow, you need to lay a concrete slab or screed of sand-cement mortar. Now you should dig the trenches for sewer pipes. Dig up the plots from the house to the septic tank, and from the septic tank to the infiltrator. Their depth should be sufficient to create the desired slope. In order for runoff to flow by gravity, a gradient of 1‒2 degrees is needed. 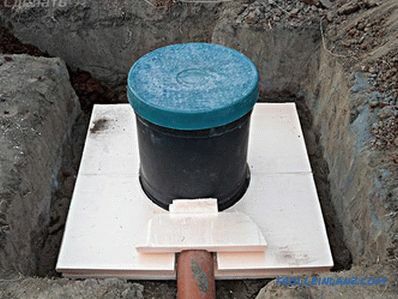 If there is no concrete screed on the bottom, it is advisable to make a base for the installation of a septic tank. Gravel may be used as such. The thickness of this layer should reach 40 cm. Now it is time to lower the construction of the septic tank in the pit. Installation takes place manually or with the help of technology. Everything will depend on the volume of containers. 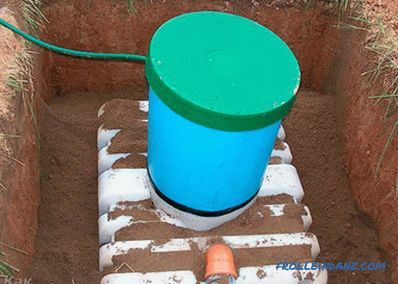 When lowering, make sure that there is no distortion, this can reduce the efficiency of the septic tank. If a plate or a coupler is installed at the bottom of the pit, it is necessary to fix the septic tank body with braces or straps. The next step will be the installation of sewer pipes and connect them to the septic tank. Trenches under the pipes are filled with a mixture of sand and soil. Make sure that the material used for backfilling is not large stones and solid pieces of earth. Now we start backfilling the excavation. To do this, we use a mixture of sand and cement in the ratio of 5 to 1. Backfilling takes place in layers of 20–30 cm, followed by tamping. All work is done only manually. When using technology can damage the walls of the septic tank. To prevent the septic tank from deforming, it must be filled with water. But this is also done gradually, as far as backfilling of the excavation. It is necessary to ensure that the water level in the tanks was 20 cm higher than the level of the mixture filled. Before the final backfilling, the septic tank needs to be warmed. To install the infiltrator, you need a separate pit . He rummages at a distance of one and a half to two meters from the exit of the septic tank. Geotextiles and a cushion of rubble are laid at the bottom, its height should be at least 40 cm. 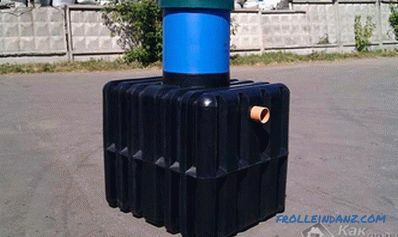 The infiltrator is mounted on the bottom and connected to a septic tank. At the entrance you need to install a ventilation tower. The pit is poured over the top cover of the infiltrator. Only sand is used for backfilling. Installing a septic tank ( and similar to him in construction) is quite simple. Even if you made small flaws, the device will work fine. Microorganisms in a biofilter do not tolerate chlorine Sometimes an unpleasant smell can occur. This is either due to lack of ventilation, or due to the poor performance of bacteria in the filters. Such faults are easily eliminated. If you forget to install ventilation, then it is easy to fix. It is enough to dig out a ditch with an infiltrator and to make installation of the ventilating channel. The poor performance of microorganisms in biofilters is associated with undesirable elements in the effluent. Bacteria poorly tolerate some medications, detergents containing chlorine and antibacterial additives in powders. If you use such means, then it is desirable to stop it for a while. After the restoration of the vital activity of the microorganism colony, the unpleasant smell will disappear. In the future, the use of such substances is better to minimize.